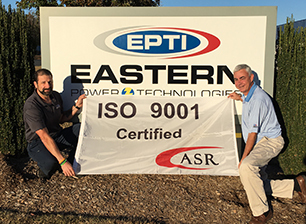 Eastern Power Technologies, Inc. is proud to announce that American Systems Registrar, an accredited, third-party system registration, has determined EPTI has established a quality management system in conformance with the International Quality System Standard ISO 9001:2015. ISO 9001:2015 combines a process approach with risk-based thinking to help create a quality management system that encourages growth and sustained success. This brand new standard is more focused on actual performance as opposed to procedure like earlier versions. EPTI is excited to have a certified quality management system after striving for many years to provide our customers with a high level of service and quality products. This certification is an excellent step in letting our current and potential customers know that we are focused on performing to their standards and beyond. Find out more about our quality policy and quality management system on our website: www.easternpowertech.com.